In 1683, T'aiwan returned to China as a part of Fukien Province, when she was captured by the Qing government. 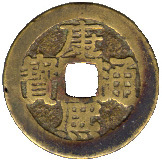 But until 1689, a mint was established in T'ainan and cast coin bearing with "T'ai" mint marks in both Chinese and Manchu scripts on the reverse. 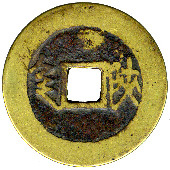 Taiwan Mint was terminated in 1692. That is why Taiwan coins are rather scarce. 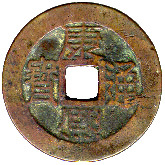 T'aiwan cash are comparatively small and the large cash are forgery or recast in the later period as "poem cash" only. 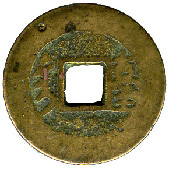 This coin was cast by the Kweilin mint of Kwangsi province with the "Kwei" mint marks written in both Manchu and Han script on the reverse. In 1668, Kweilin mint was first cast copper cash of 1.4 mace in weight and later reduced to 1 mace in 1683. 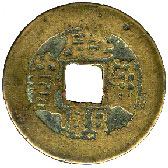 But, Kweilin mint cast cash of 1.4 mace again in 1702. During the 61 years of the K'ang Hsi reign, Kwilin mint had cast cash for 46 years, it had been produced copper cash about 1,184, 960,000 pieces. This K'ang Hsi T'ung Pao was cast by Sian mint of Shensi province. 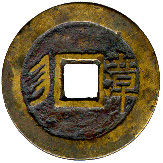 On the reverse are the "Shan" mint marks in both Manchu and Han scripts . The Sian mint was first established in the 2nd year of the Shunchih reign (1645AD) as the provincial mint. In 1662, Sian mint was terminated casting coins just as other porvincial mints, and it reopened in 1667. At last, it had stopped casting coins in 1670. Have you noticed the different appearance in colour of the Yunnan Kanghsi cash? It is a little reddish appearance compared with other cash. 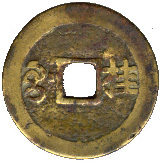 The composition of the standard cash was 60% of copper and 40% of zinc during Qing dynasty. But cash cast in Yunnan Province was exception which was allowed to use 20% zinc and 80% copper to cast coin, because zinc was more expensive than copper in Yunnan Province. There were at least seven mints in existence in Yunnan Province during different period of Qing dynasty, in cluding Kun-ming, Ta-li, Meng-tse, Lin-an, Chan-i, Lu-feng and Tung Ch'uen Mint. Yunnan mints produced about 288 million pieces of copper cash each year during K'anghsi period. In 1686, Fan Cheng Hsun, Governor General of the Yunnan and Kueichui Provinces, found that there were so much copper cash produced by the Yunnan Mints. The over supply of the copper coins had caused the price of the cash to reduce. The government needed to pay 30% of cash coins in stead of silver for the army's pay. It was very inconvenient for the soilders. Disturbances were caused in the military. After Fan put down the trouble, he urged to cease casting coins in Yunnan Province and paid to the soilders with silver only. All the Yunnan Mints were terminated in the 28th year of the K'anghsi reign (1689AD). 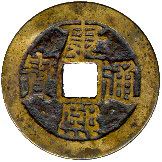 The Changchow Mint of Fukien province was first established in 19th year of the K'ang Hsi reign (1680AD). 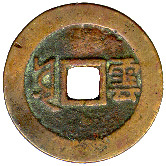 It began to cash K'ang Hsi T'ung Pao bearing with "Chang" mint marks in both Han script and Manchu script on the reverse. Please noted that there was another mint, Foochow mint existing in Fukien province too. 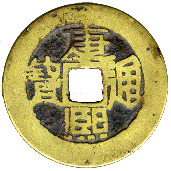 But Foochow mint ceased minting in the 9th year of the K'ang Hsi reign (1670AD). In 1682, Changchow Mint which for reasons unknown was terminated to cast coins. Actually, it had cast cash for 2 years only. Changchow coin was not so many. More about K'ang Hsi T'ung Pao Part A, or Part B, or Part C, or Part E.
(Zhong Guo Lishi Bianlan) ISBN 7-01-000308-4/k.53.